Machine is little heavy (80 lbs.) and needs to be picked up by the base. Please do not lift by clear plastic liquid holders. This might make the unit leak or become dislodged. Each side holds 1.5 gallons of product. This unit works better if you add your spirits to your cup. Plus the kids will be able to enjoy the virgin beverages with you. 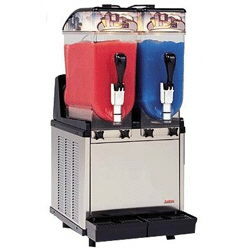 * Please call us for any questions on our slushie machine sm rentals in New Britain PA, serving the Greater Philadelphia area.